It's just a month until The Postal Museum opens in its new premises at Freeling House - a wonderful interactive playing space with informative galleries of historical events, although their website doesn't actually mention the collections of stamps of which it is guardian. I suppose they needed to advance from the old National Postal Museum to appeal to a much wider clientelle, and as we have so much history attached to the creation of the postage stamp, and the establishment of the postal service, it is right that there should be more to it than stamp collections. However, they have a 'Visitor Experience Team' - what agency dreams up these names? Delve deep enough through their website - totally different from that of the BPMA - and you will eventually alight on the Collections area including the Philatelic Collections. However the accessible collections of British stamps seems to stop at 1970. We can only hope that they will eventually make available various aspects (including artwork and unadopted designs) of all modern British definitive, special stamps and even the full range of Post and Go stamps. Which brings me to what many visitors will spend their money on, whether or not they go into the Museum itself, the Post and Go machine. 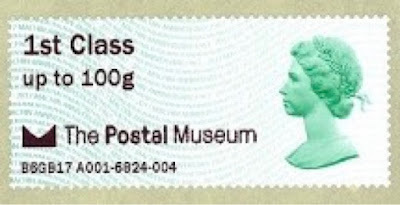 I suspect the Museum's income from this is no more than 5% of the face value of the stamps sold (other than the ones they 'buy' to sell as FDCs or packs through their shop), and they will probably make more money from the shop than from machine sales. LONDON, 28 June 2017 – The Postal Museum has announced today that it will be moving its Post and Go machine from Freeling House to its new home at The Postal Museum on Phoenix Place on 13 July. As a result of the move the Post and Go machine will be unavailable from 13-24 July inclusive and again from 26-27 July inclusive. From 1000-1700 on 25 July the museum will provide exclusive access to the Post and Go for one day only to give collectors an early opportunity to purchase its new ‘official opening’ overprint in advance of the public opening. The machine will be available 7 days a week once the museum opens in full on 28 July. This marks a change from previous communications that stated the machine would only be unavailable 13-16 July and has been necessary due to delays in the planned opening of the new museum. - On Machin 50 Commemoratives and Machin 2nd Class this will read ‘Official Opening 2017’. - For other issues it will simply read ‘Official Opening’. From 25 July, The Postal Museum will also be introducing a new permanent postmark. All current stamp issues featuring The Postal Museum’s envelope marque overprint will finish on Wednesday 12 July. The Post and Go machine will be available at The Postal Museum during normal opening hours. These will be made available shortly on the website www.postalmuseum.org. Commemorative First Day Covers and Presentation packs will be available to purchase from The Postal Museum’s shop. My apologies if the release is unclear. The overprint will be in the machine for some time, most likely until Autumn Stampex. The 25th will be the first day of this being issued. Therefore from 5 June to 25 July 2017 The Postal Museum will have had Kiosk A001 dispensing 32 labels and when the new inscription stamps are released without the "Opening" inscription this number will increase to 57 which seems rather a lot to me. It is worth noting that the Machin Head 50th Anniversary labels with Postal Museum inscriptions (with "envelope" marque) were only introduced on 5 June 2017 and that they will therefore have a short lifespan of less than 2 months. The Machin Anniversary stamp with Postal Museum logo. We shall not be stocking these, but there will undoubtedly be plenty available on dealers' and auction websites. I'm only the messenger and I don't understand it. The person who sent out the press release is on holiday. I forwarded my reply to the directed alternative yesterday but no reply yet. Try sending an email to the museum. From the announcement: From 1000-1700 on 25 July the museum will provide exclusive access to the Post and Go for one day only to give collectors an EARLY opportunity to purchase its new ‘official opening’ overprint in ADVANCE of the public opening. The machine will be available 7 days a week once the museum opens in full on 28 July. I think it should be granted that the new overprints will continue to be used from 28 july until further notice. I thought that the 'envelope' marque should have been used somehow on the new Post & Go stamps as this is part of the museum's logo especially as this is for the new Postal Museum. It appears from the two illustrations shown that it just a matter of 'sticking on what you can'. There is 2017 on the Machin head because it fits but is left of the Union Flag stamp because it does not fit. Correct. If they were to reduce the image of the Union flag, just a small amount (10%?) - then 2017 would fit and we would have consistency. If that was done there would be more than one version of the Union Flag stamp, possibly running in parallel which would give everyone something else to moan about! I take your point regarding a variation on the Union Flag but I am sure something could have been done to incorporated the Postal Museum logo as it was designed. With regards to the 2017 on the Machin but not on the Union Flag I would take it off both stamps and just use the words 'Official Opening'. PHOTOBUCKET ALERT! A new sort of ransom! Machin anniversary slogan starts June reports.